No special wish for a special friend like you. The best thing in the world is to love and to be loved, especially from a person like you. Happy Birthday my friend! I’m so grateful for having a friend like you. Happy Birthday! Life wouldn’t be the same without a friend like you. Happy Birthday my mate! Wishing you all the greatest things in life, my beloved friend, because someone so special as you are deserves the best. Happy Birthday my mate! May every dream of yours come true. Friends are the reason of happiness for everybody. Thank you for being there for me, supporting me and giving me profusely every piece of yourself. Thank you for my happiness. I’m so thankful I found I friend like you; a friend who fills my life with a pleasant dew every single day. Happy Birthday my buddy and may every wish of yours turn to reality! You are the reason my spirits always take an uplift, you are the best ever given gift! Happy Birthday my friend! My best wishes for a furious and voracious day filled with plenty of smile and laughter my mate. Happy Birthday to you! Happy Birthday to the world’s greatest friend! Hope you never lose the brightest smile of yours, which gives me always the mood to go outdoors. Happy Birthday! Thank for your friendship throughout all those years. Happy Birthday! Our friendship is made of gold and it will never rust, will stay precious until the world turns to dust. Happy Birthday and may your every wish come true! Thank you for reminding me every moment that friendship is a gift, especially when that gift is from you. Happy Birthday! Hope you live forever, because this is what I am planning to do and the sure thing is that I am going to need you. Happy Birthday buddy! You are always there to bring a smile on my face and make me laugh though the worse of my days. Thank you my friend. May every step of yours be greater than the others. Happy Birthday! 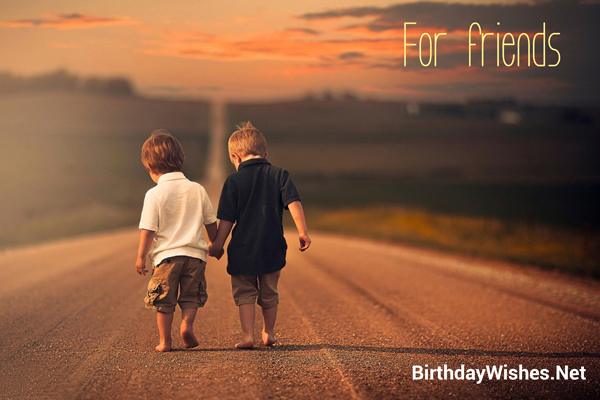 Where would we be in this world if we didn’t have a friend? The sure thing is we wouldn’t be in someone’s Birthday. May you always have friends surrounding your every day. Happy Birthday my friend! Look for the best and leave behind all the rest. Happy Birthday my friend! Wishing you tons of happiness and joy on your special day. Happy Birthday my mate! With you all my sorrows are converted into joys, questions into answers. No one can replace you in my life and there is always a special place for you in my heart as a friend. May all your life be sweeter as your birthday cake and will remain the same ever. 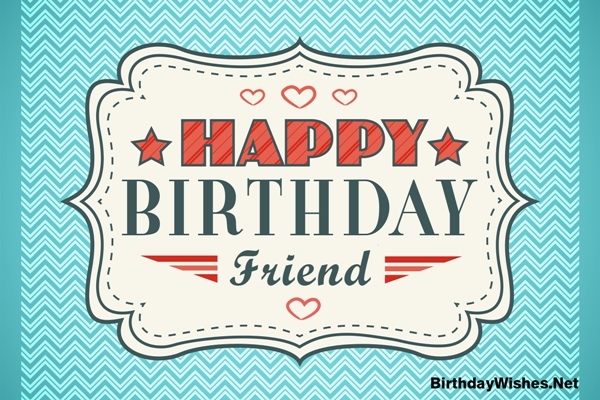 Wish you a very happy birthday my dear friend!! Thank you for everything you have done in my life. You are my best sibling that god forgot to give and so he gave me as a friend. You made my life amazing and may we be like this forever and ever. May all your dreams come true and may you have a fantastic birthday. Wish you a very happy birthday!! Friends are hard to find and best friends are even hard, I am glad to have you as my best friend in my life. Stays blessed for the whole life and have a wonderful birthday! All I wantto say is a very happy birthday to my dearest friend ever. May all the luck is yours and all thehappiness in the world come to you. Happy Birthday my dear!! One year older means one year wiser. The truth is that our company needed an old wise man like you. Happy Birthday my mate! The word friend is just a sequence of letters for many people. For me it is the source of my strength, my happiness, my wealth, because of you. Thank you my friend and Happy Birthday to you! Wishing to the favorite person of mine in all over the world all the favorite things on his special day! Happy Birthday Buddy! A good friend like you is something hard to find, especially in nowadays, but when you find that friend it’s like visiting heaven in a daily base. Happy Birthday my friend! May our friendship last forever through the brightest days and the darkest nights. May my wish come true to go through the game of life with you. Happy Birthday! May the special day of yours be filled with loving memories full of fun and the company of good friends. Happy Birthday!